Online reviews are vital for your brand reputation and earning new business. You’re having problems with your heating. Or your hot water heater. Or a number of any home services issues. How are you going to choose a company to fix your issue? Well, probably the way that we choose a lot of solutions for our problems nowadays – Google it. How does your business fare? How many businesses show up? First thing you see below the paid ads, are the results from the Google Local Pack. This will only show the top 3 or so businesses until you click “More Places.” Does your business show up as a top contender? Click on “more.” Where does your company show up there? Even below the Google Local Pack, most likely you will see some other review sites, such as Yelp, showing up as a result. It may have a title such as “The 10 Best” or “Best Near Me” with lists of their own. And what are these lists and the order in which companies show up dependent on? Now, staying in the place as a consumer searching for help for their home service needs, who would you end up calling or asking for more information from with these search results? Most likely, those with the best online review presence. Whoever shows up at the top probably has the best reputation. The higher your star rating and the more reviews that your business has, the more reputable you are. Start earning more online reviews and start being the first choice for consumers that need your products and services. By providing superior customer service and asking for online reviews, you will start improving your online brand reputation and earning more customers organically. Need help managing your online review presence? Take our quick quiz and see where you stand! 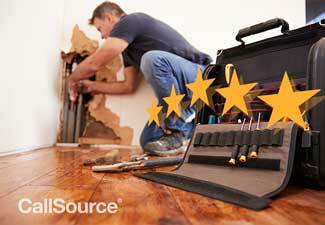 For even more information, contact a specialist and ask them about CS Reviews, our online review platform.